Tim Brown is a veteran professional pitcher and travel enthusiast who has been playing professional baseball for 8 years and has established himself as one of the best pitchers in independent professional baseball history as stated in this June 2015 post. Although Tim is still dealing in pro ball in the U.S. for the Wichita Wingnuts, his love for travel has him looking overseas for the 2017 summer after getting more than a taste of travel baseball the past four seasons in Australia. A 2009 graduate of Pittsburg State University, Tim has spent his professional years playing mostly in the American Association and in the Frontier League with a brief stint in the Philadelphia Phillies organization. In his past three seasons with the Wingnuts he held down an era of 3.12, 3.29 and 4.11 respectively while going 29-10 over 384.5 innings of work. In addition to being a durable starting pitcher who goes deep into games, he also has great command highlighted by an almost 3:1 strikeout to walk ratio in his professional career. His manager with the Wingnuts, Kevin Hooper, describes Tim as very “Greg Maddux-like,” referring to his ability to out-think opponents and use his pin-point accuracy to dominate games. Tim throws a 2 seam fastball, slider, curve, and change up all for accuracy. The combination of these two strengths were on full display on July 20, 2013 when he threw a no hitter for the Gateway Grizzlies of the Frontier League. 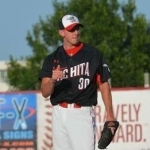 Tim also won the American Association Championship in 2014 as a starting pitcher for the Wichita Wingnuts. Tim is considered one of the best pitchers in Grizzlies history and the above video showcases the admiration and respect he has from his teammates. Tim spent the summer of 2017 playing in the Czech Republic for Hrosi Brno, finishing among the league pitching leaders with an ERA of 1.69 with 47 K and only 7 BB over 74.2.2 innings pitched. In 2018 he joined the Stuttgart Reds of the German Bundesliga South where his era was a little bloated playing on a bottom team, but his durability and SO/Ratio remained consistent with previous seasons. 2011 Grand Prairie Airhogs American Association With the team for only 3 games at the end of the season. 2014: American Association Championship, Wichita Wingnuts. If a club pays Tim’s flights and provide accommodations, he would be willing to work if they can help with finding work.